From the Star Wars The Force Awakens collection by Hasbro. 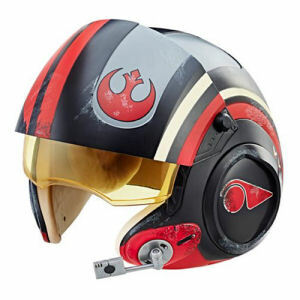 Star Wars The Black Series Poe Dameron Electronic X-Wing Pilot Helmet. From the Star Wars The Force Awakens collection by Hasbro. Star Wars The Black Series Poe Dameron Electronic X-Wing Pilot Helmet. Realistically detailed - movie-accurate reproduction of Poe Damerons X-Wing helmet. Internal microphone activates battle sounds and interaction with BB-8 (not included). Collector-grade quality helmet with retractable polarizing visor. Use the straps to adjust the fit.